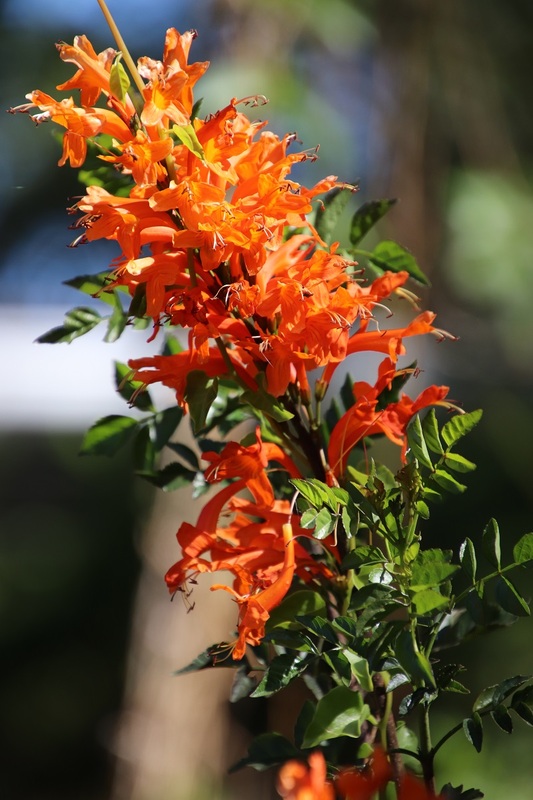 Looking through my archives, I am reminded of the long flowering period of the indigenous Cape Honeysuckle (Tecoma capensis) in the Eastern Cape. 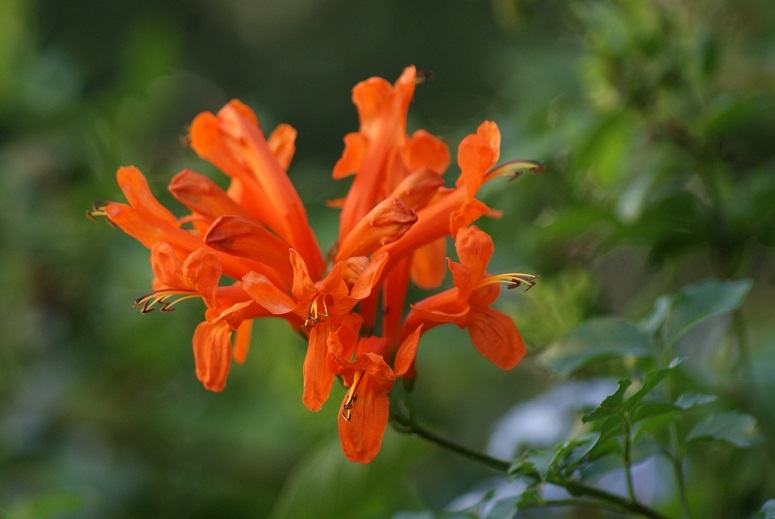 I have photographs of these beautiful orange tubular flowers stretching from September through to May. 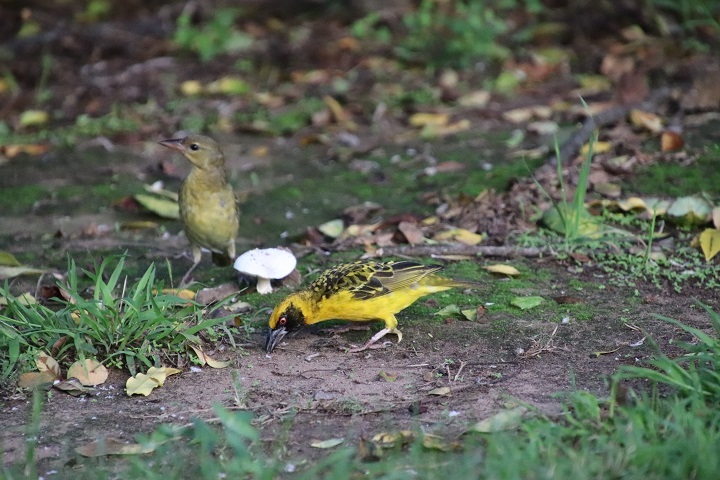 There is an abundance of them now, both in gardens and in the veld. 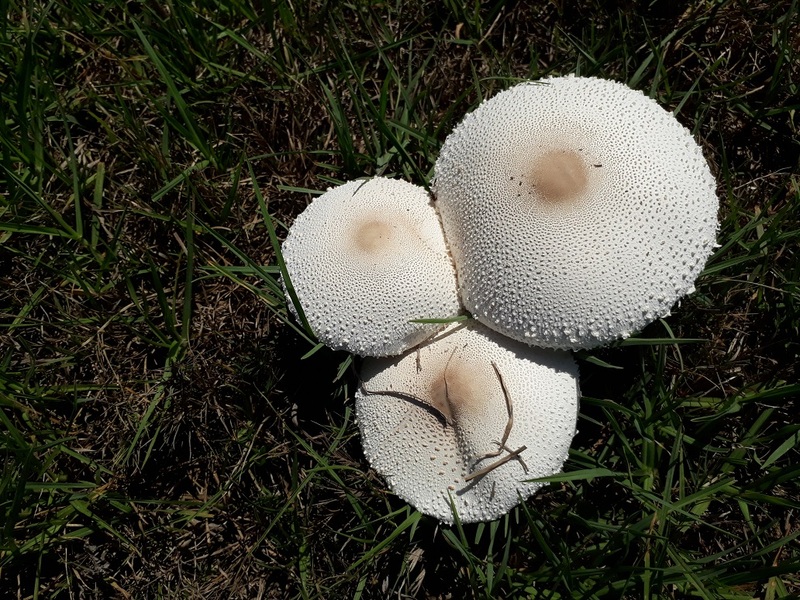 While many gardeners trim these fast-growing plants into attractive hedges, I fight a losing battle against its propensity to spread everywhere. 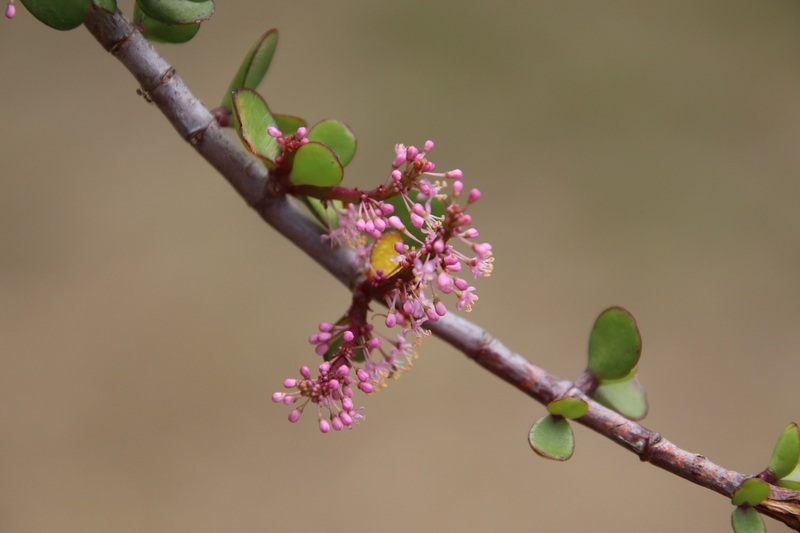 Nonetheless, it is evergreen here and forms a usefully dense screen of glossy green leaves – and I am always grateful for its very attractive flowers. 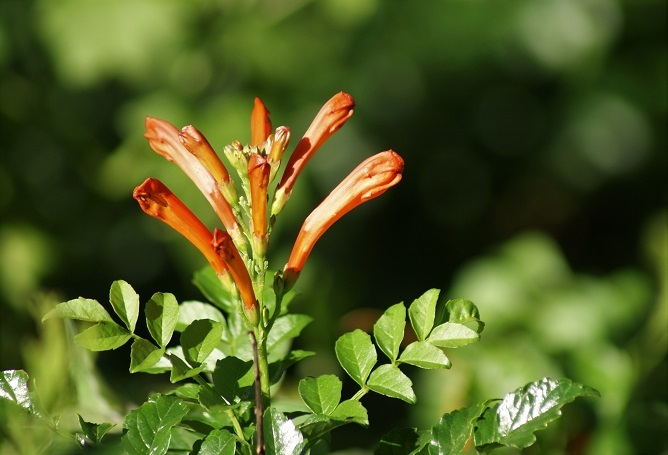 Despite its unruly, rampant growth, the Cape Honeysuckle is drought resistant and so is a welcome inhabitant in our garden, both in the sun and in areas of semi-shade. It is always a delight to see buds forming as they are the forerunners of a blaze of colour, often when we need it most! NOTE: Click on a photograph if you wish a larger view. 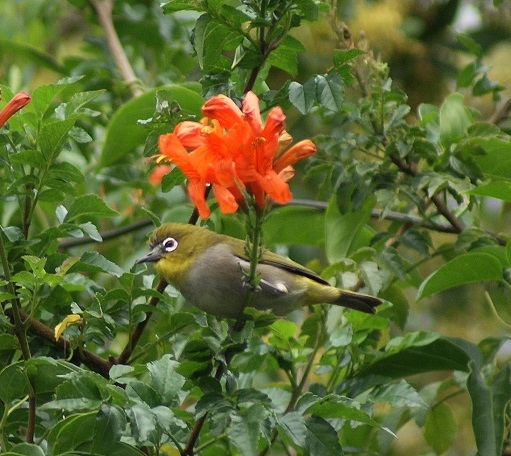 What do paint brushes and candelabras have in common? 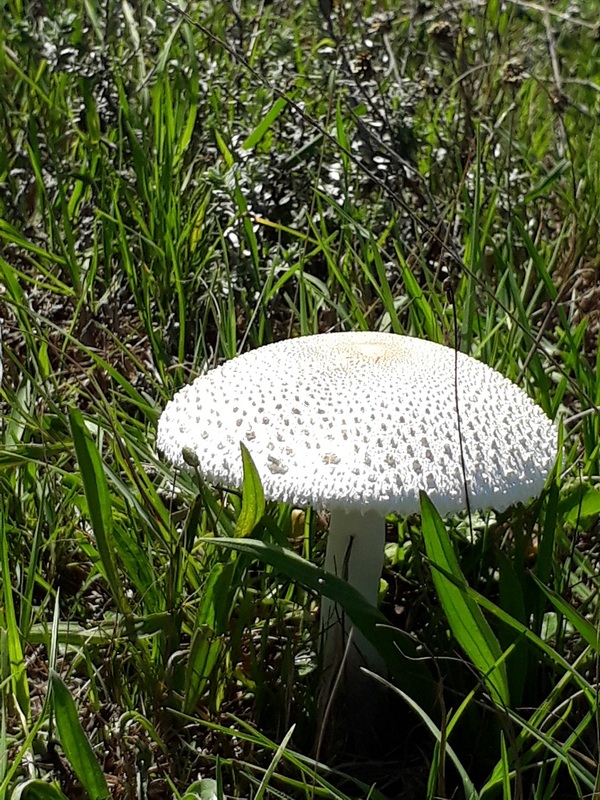 Both are lilies blooming in the Eastern Cape grasslands at this time of the year – doubtless spurred on by a little rain. 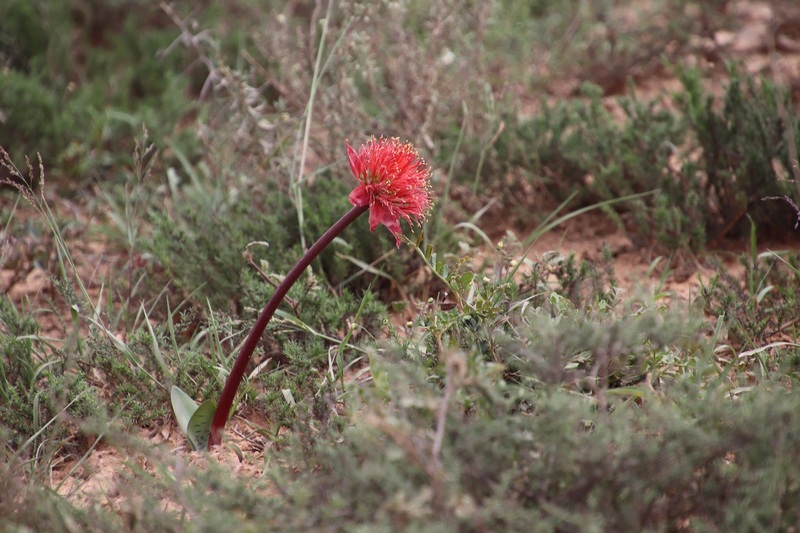 Paintbrushes first: the Haemanthus sanguineas, commonly known as April Fool in English and Velskoenblaar in Afrikaans, are dotted about singly and in small groups. Their lovely red flowers supported by a plain red stem stand out above the short grass and are easy to see. 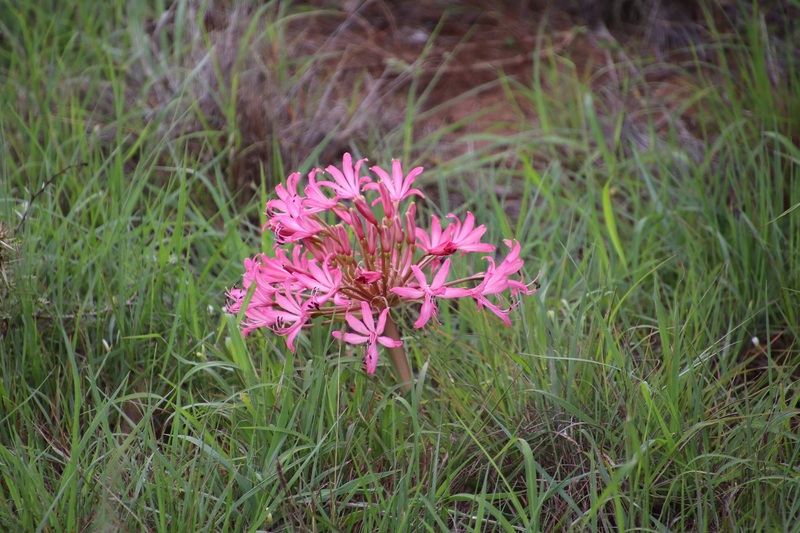 The candelabras, on the other hand, tend to appear in a much more isolated fashion, yet their beautiful pink blossoms stand out in the grasslands. This one is the Giant Candelabra Lily or Kandelaarblom (Brunsvigia grandiflora). 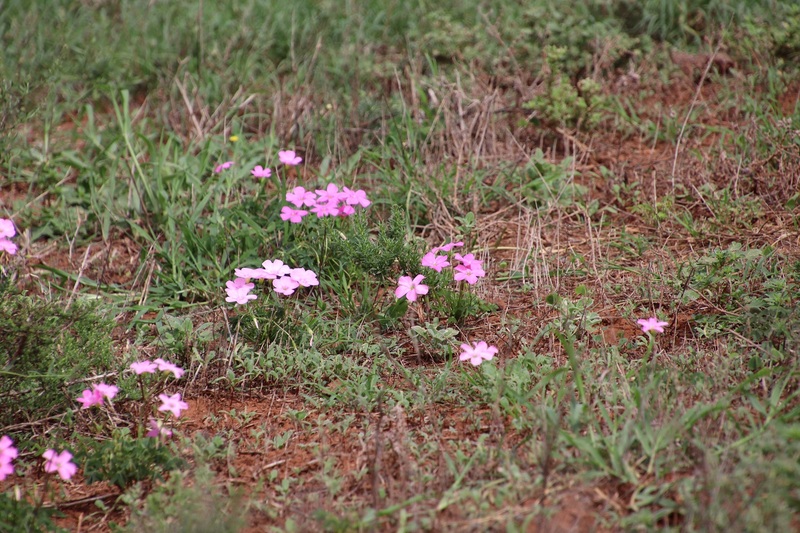 After even a little rain parts of the Eastern Cape veld are covered with swathes of pink and white flowers growing in clusters low to the ground. These are Oxalis, commonly known as sorrel and are probably Oxalis purpurea (Grand Duchess Sorrel) which is common from as far as Namaqualand to the Eastern Cape. 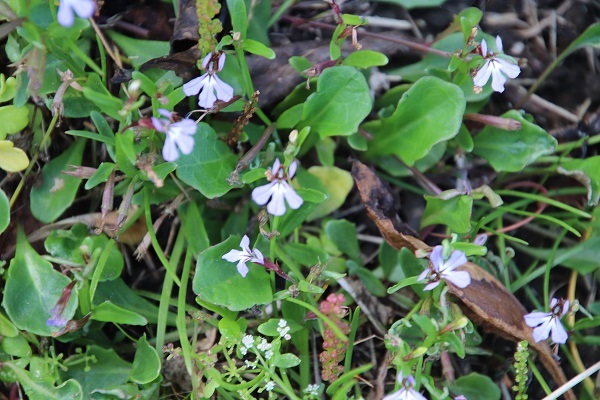 These flowers, with clover-like leaves, have a long blooming period from this time of the year, extending into winter. 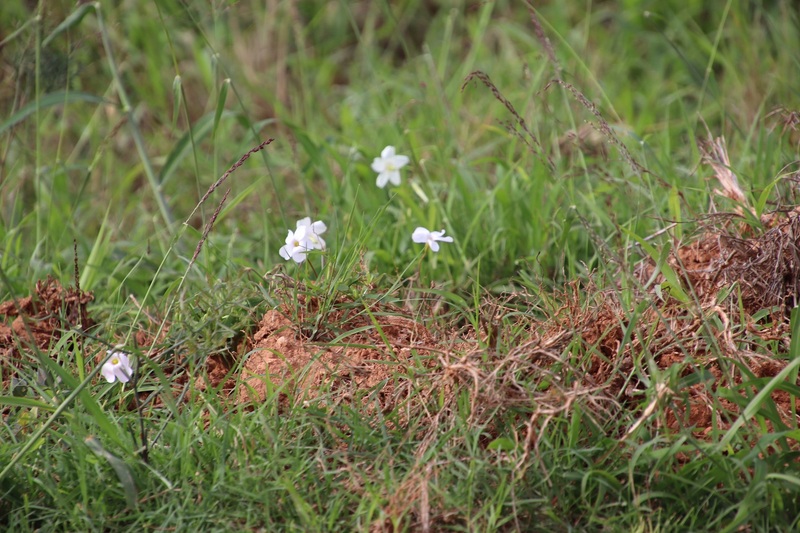 These flowers will have to remain nameless for the time being – any positive identifications will be welcomed. 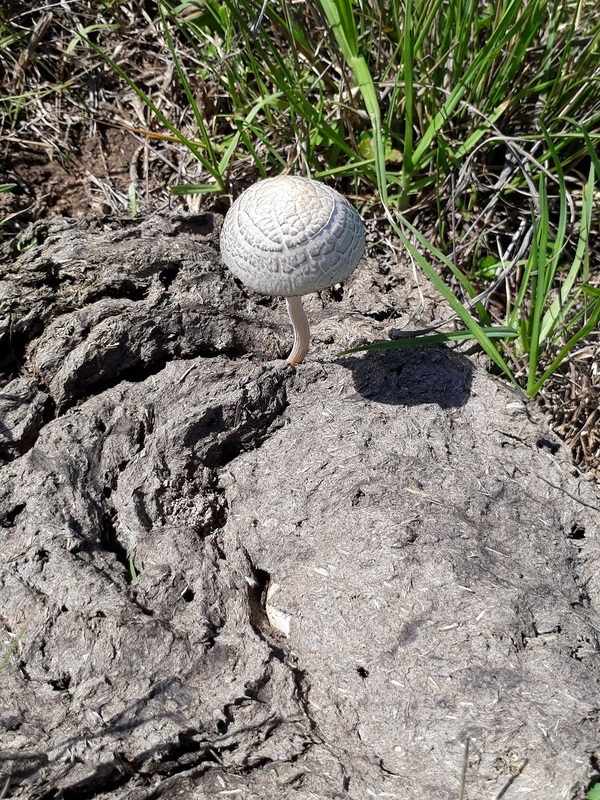 Nonetheless, I find that the presence of even tiny blossoms can lift my spirits and felt so upon seeing lovely flowers blooming on the bank while we were pitching our tent on the Tsitsikamma coast. 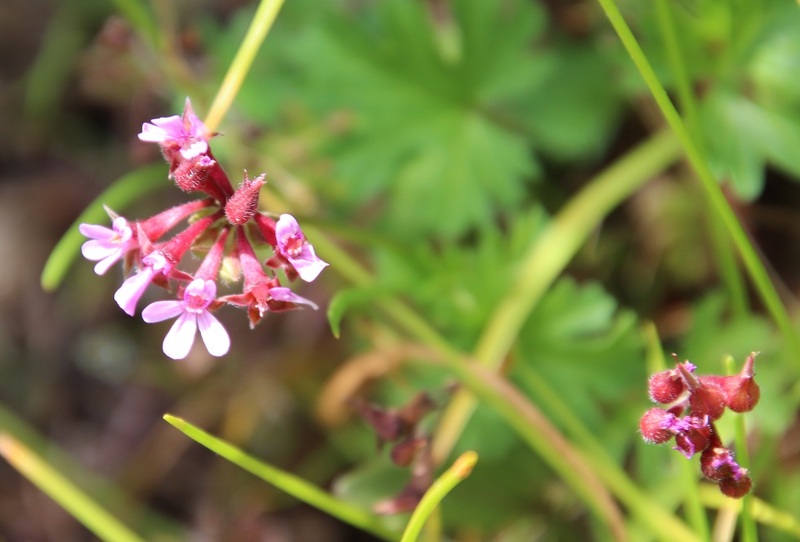 These delicate pink flowers mingled with the blue to great effect. 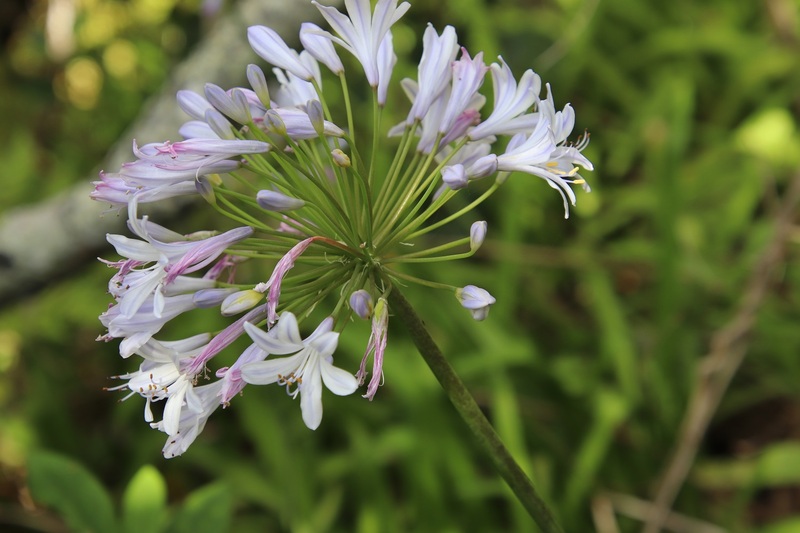 I have mentioned the lovely agapanthus blossoms growing along the path leading towards the Storms River mouth. 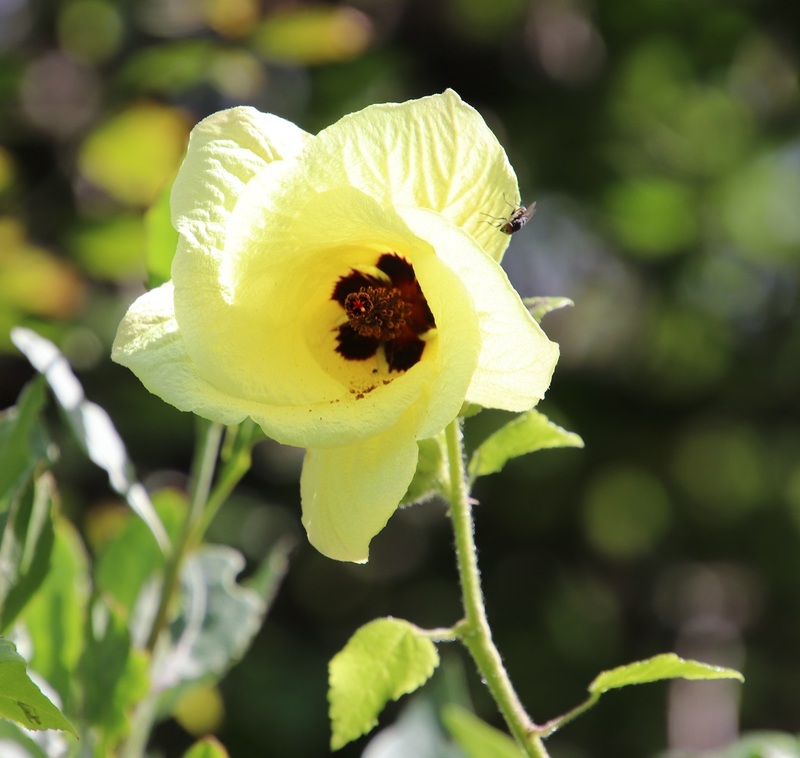 An array of these beautiful yellow hibiscus flowers also brightened up that pathway. 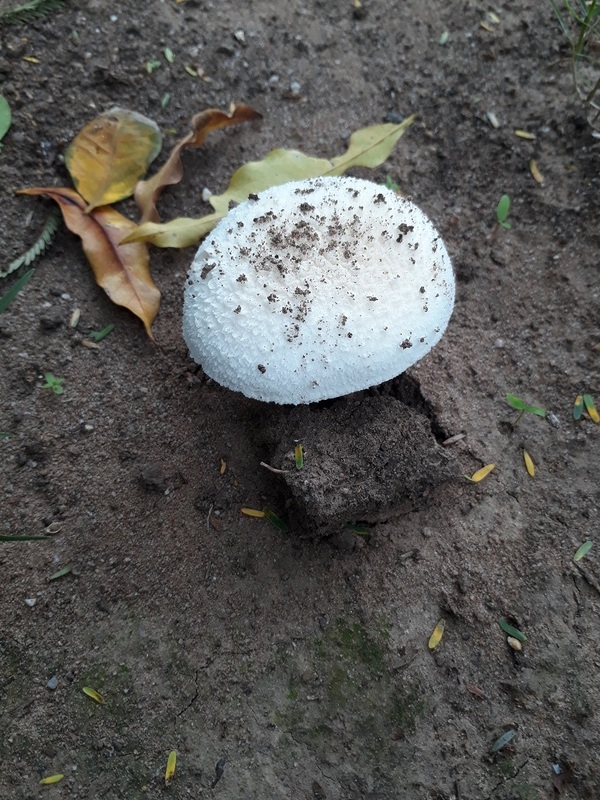 Note: click on a photograph for a larger view. 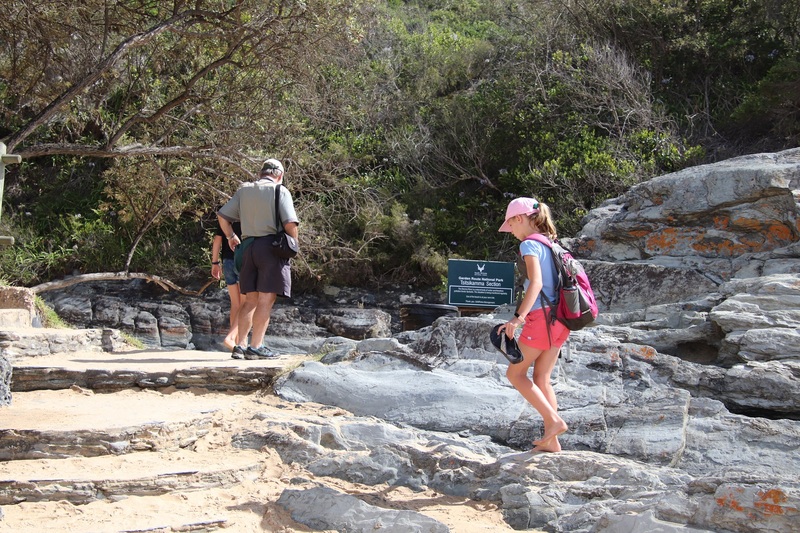 The walk through the coastal forest at Tsitsikamma to the Storms River starts at the little beach. 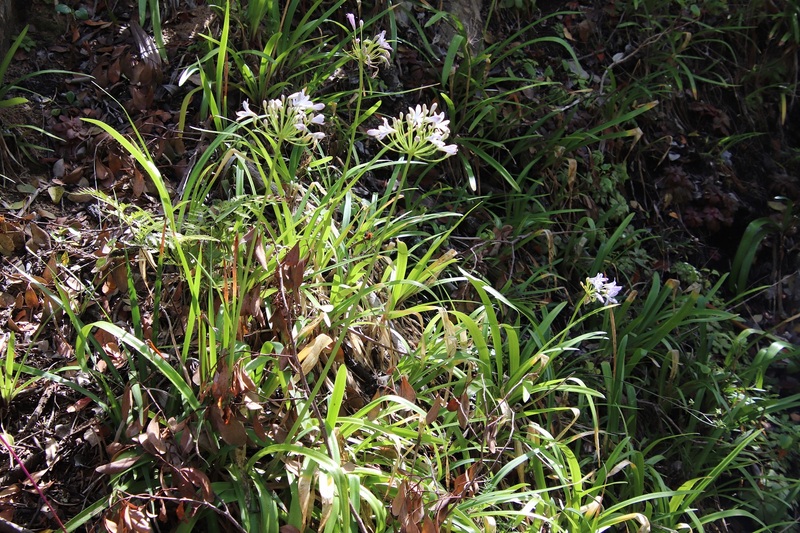 A lovely collection of light blue agapanthus flowers grow near the first waterfall. 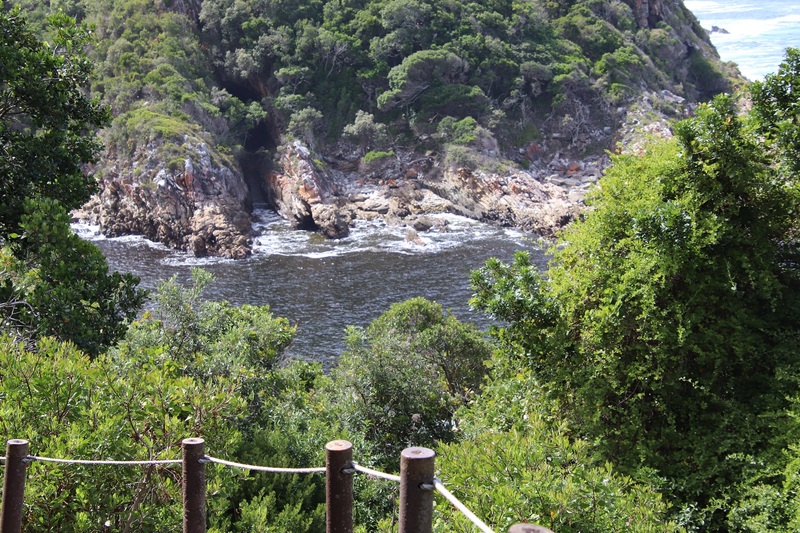 One gets interesting views of the coast and of other paths through the forest trees. 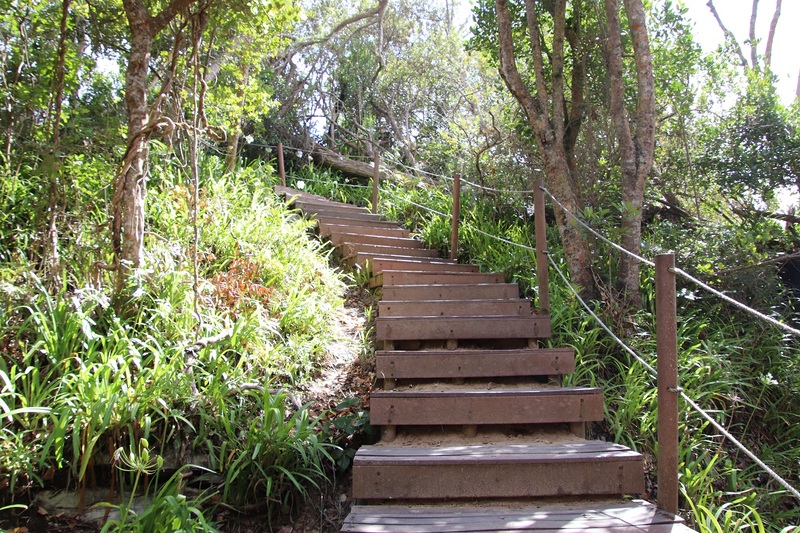 Steps made from plastic wood make the steep ups and downs easier to manage and help to protect the forest floor from the hundreds of feet that pass this way every day. 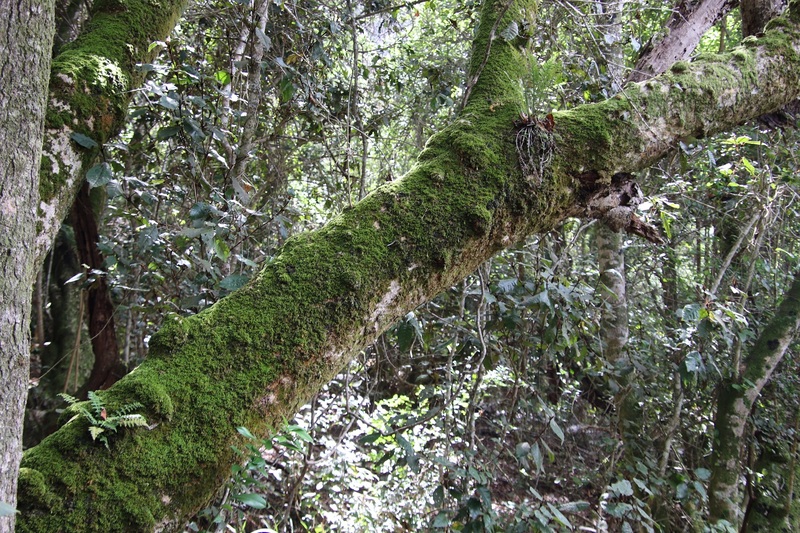 Moss-covered trees abound in the forest. 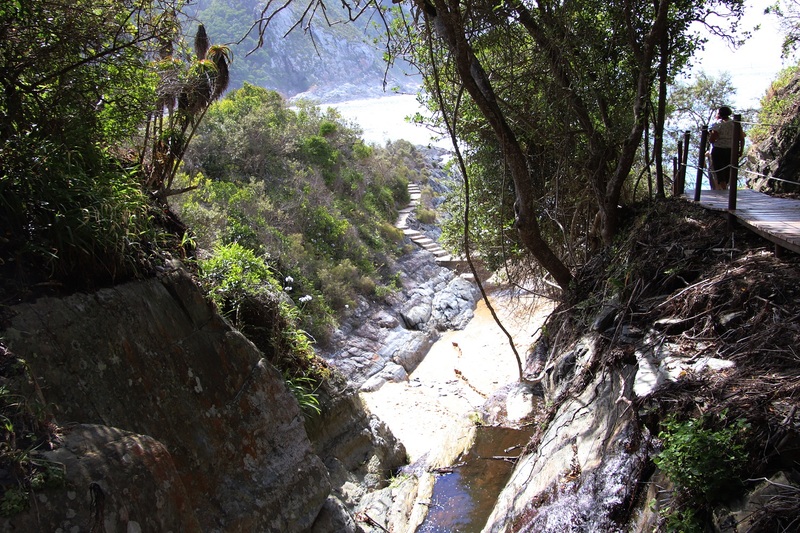 The first glimpse of the mouth of the Storms River way below the path. 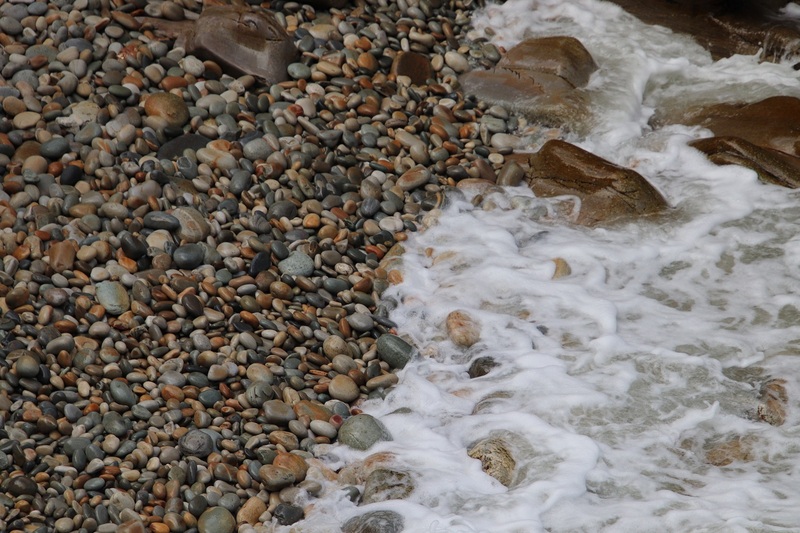 There is a rocky beach at the end of the walk. 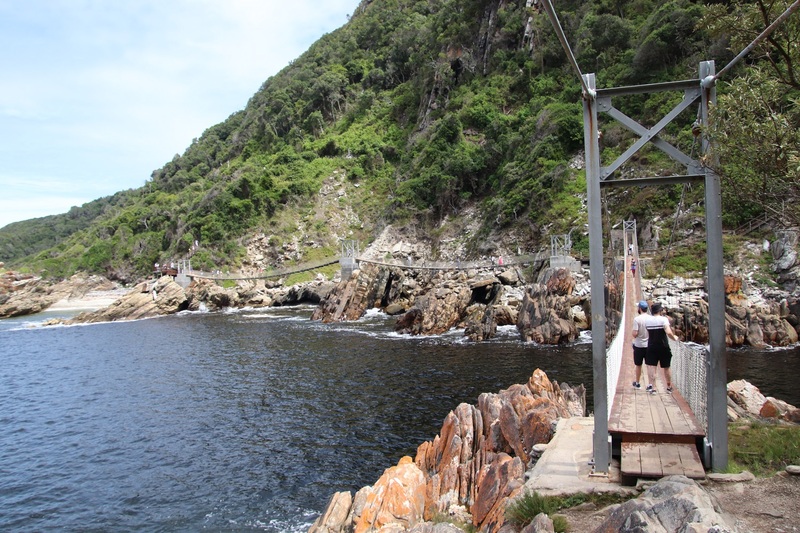 And a series of suspension bridges to cross on the way back! 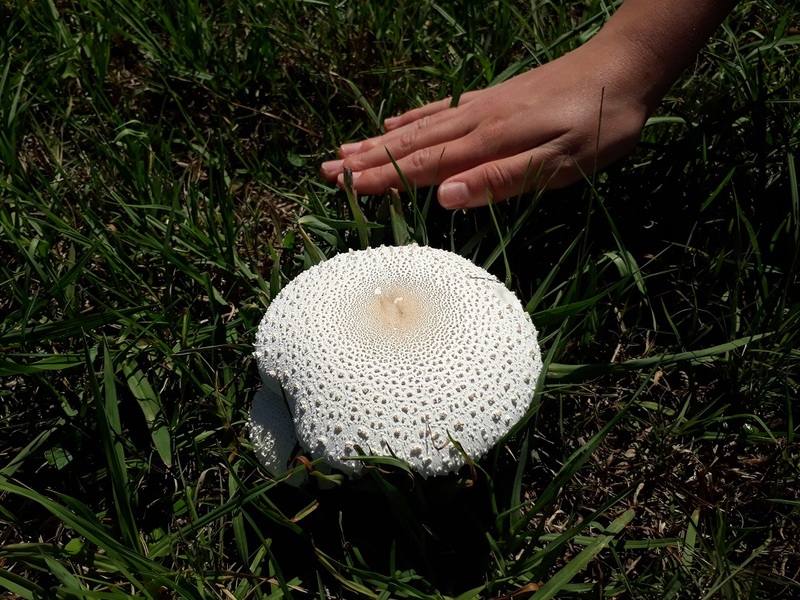 Happily, despite the drought, our indigenous garden shows pops of colour now and then. 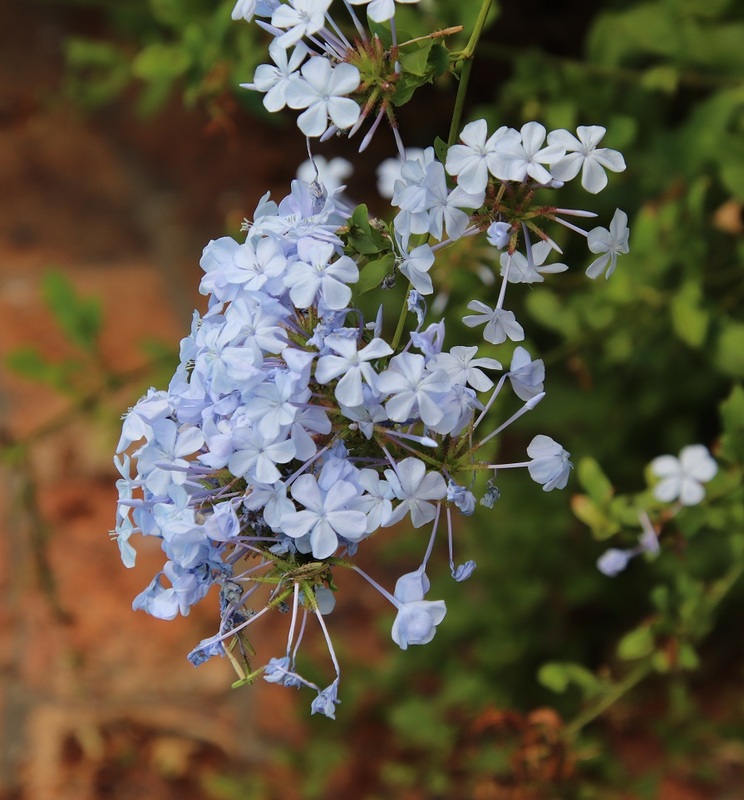 The predominant colour that has brightened the garden over the past few weeks is the light blue of the Plumbago. The biggest surprise though has been the pale pink blossoms showing on our Spekboom for the first time ever, even though this particular plant has been growing in the garden for about seven years or even longer. 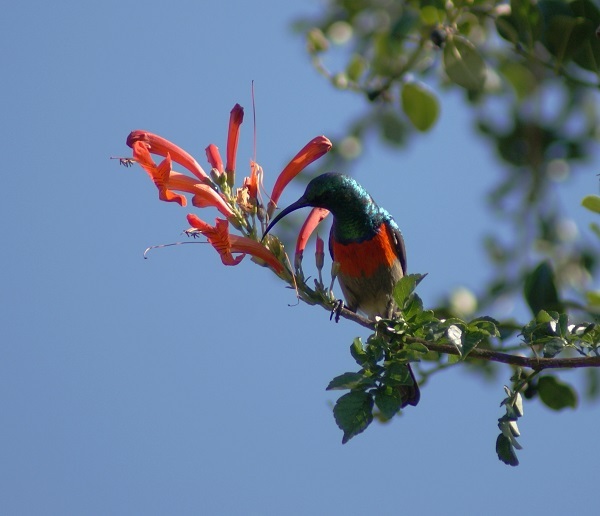 So, those of you with ‘bloomless’ Spekboom in your gardens … there is hope after all!